Usually towards the end of the year, we always hear about how many players the Texas Rangers have used overall in any particular season. The Rangers are usually towards the high end of that list. Injuries, callups, usually make for a long list, and you tend to forget the guys who are here so quick that they don’t even have time for the proverbial “cup of coffee”. I’ve done this for the last several seasons (2017 will be the 10th season I’ve kept track of this), and it’s worked out pretty well. I’ve also gotten some positive feedback on it, so it’s become a permanent feature here. If you’d like to see the final tallies for the other years I’ve done this, you can still see them with links at the bottom of the page. Anyway, this post will get bumped whenever there is a player who is making his first appearance for the Texas Rangers in 2017. I am going to count guys who get called up, but don’t play immediately (or sometimes don’t play at all), as they will be part of the 25 man roster officially. So here goes. The most recent additions will be on the top of the list. #25 to #1 (no particular order): Dario Alvarez, Tony Barnette, Matt Bush, Alex Claudio, Yu Darvish, Sam Dyson, A.J. 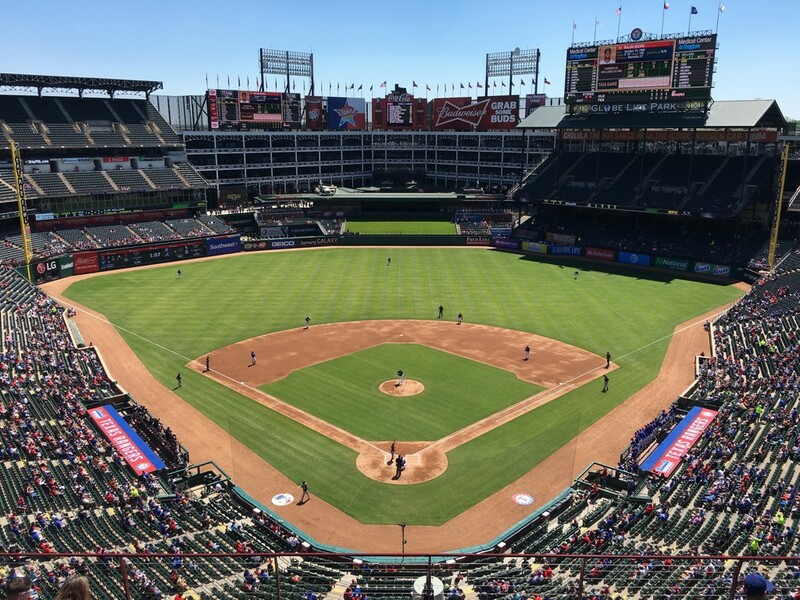 Griffin, Cole Hamels, Mike Hauschild, Jeremy Jeffress, Jose Leclerc, Martin Perez, Robinson Chirinos, Jonathan Lucroy, Elvis Andrus, Joey Gallo, Mike Napoli, Rougned Odor, Jurickson Profar, Drew Robinson, Shin-Soo Choo, Delino DeShields, Carlos Gomez, Nomar Mazara, Ryan Rua. The number of position players and pitchers doesn’t sync up, because Brett Nicholas (backup catcher) pitched on July 26, 2017. Previous years counts for major league debuts.. 2016 (1, Barnette), 2015 (6, DeShields, Kela, Klein, Rua, Smolinski, Verrett), 2014 (1, Seth Rosin), 2013 (2, Leury Garcia & Smokin’ Joe Ortiz), 2012 (2, Darvish & Ross), 2011 (1, Mason Tobin), none in 2010, 2009 (1, Elvis Andrus), and 2008 (1, Kaz Fukumori). 9 guys are on an Opening Day roster for the first time: Alvarez, Bush, Claudio, Gallo, Hauschild, Leclerc, Mazara, Profar, Robinson. While the final decision/announcement on Josh has not been made, I cannot see how his decision is anything else other than “retire formally”. Watch this video, it’s quite amazing, and is way better than anything I could even dream of writing. Excellent EXCELLENT piece. 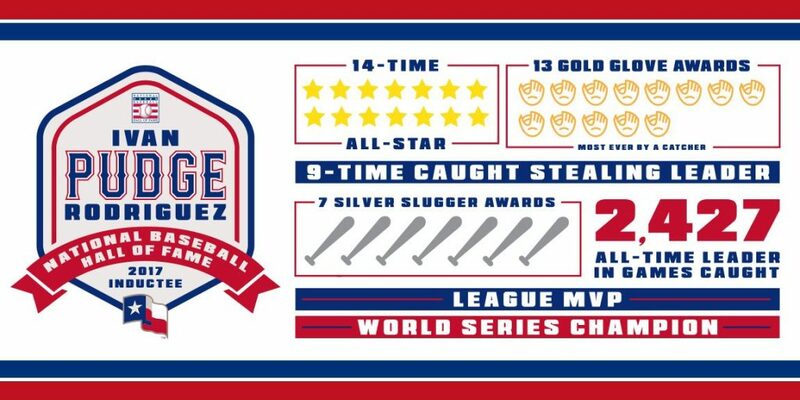 Pudge is a Hall of Famer! Congrats to Pudge, who was elected to the Hall of fame today. He goes in with Jeff Bagwell & Tim Raines (plus Bud Selig & John Schuerholz). Two catchers have reached the Hall of Fame on 1st ballot: Johnny Bench and Pudge Rodriguez. 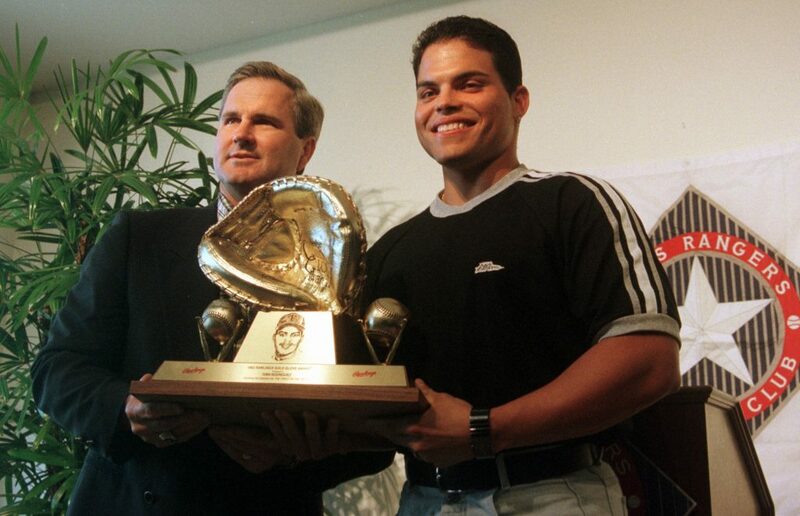 Pudge is now the youngest member of the Hall of Fame. Ivan Rodriguez makes it official: He will wear a #Rangers cap on his Hall of Fame plaque. Only the HOF is “official”, but that post is darned close. Here’s a couple of videos of him taking the call at home. I saw Pudge play almost all of his career in Texas, including the back half of the 2009 season when he returned via trade. Was an awesome player to watch, and steroids charges be damned. I’m glad to see him going in. Only the second catcher ever (Bench) to go in on the first ballot. While I can’t make it to the ceremony, I’ll definitely be watching it. And finally, some tweets from his teams congratulating him. You brought a championship mentality to a young team and helped start an era of baseball excellence in Detroit. First our champion. Now a legend. The Yankees did not congratulate him on his induction, but he was only a Yankee for about eight weeks. The Astros didn’t, either – but then they had their own guy go in today, so that’s understandable. Anyway, this post will get bumped whenever there is a player who is making his first appearance for the Texas Rangers in 2016. I am going to count guys who get called up, but don’t play immediately (or sometimes don’t play at all), as they will be part of the 25 man roster officially. So here goes. #25 to #1: Tony Barnette, Jake Diekman, Sam Dyson, Andrew Faulkner, Cole Hamels, Derek Holland, Keone Kela, Phil Klein, Colby Lewis, Martin Perez, Shawn Tolleson, Tom Wilhelmsen, Robinson Chirinos, Bryan Holaday, Hanser Alberto, Elvis Andrus, Adrian Beltre, Ian Desmond, Prince Fielder, Mitch Moreland, Rougned Odor, Shin-Soo Choo, Delino DeShields, Ryan Rua, Justin Ruggiano. * Bryan Holaday pitched in a game on Jul 2, and Jared Hoying pitched in a game on Jul 7. The Rangers don’t count position players pitching as a “pitcher used”. Previous years counts for major league debuts.. 2015 (6, DeShields, Kela, Klein, Rua, Smolinski, Verrett), 2014 (Seth Rosin), 2013 (Leury Garcia & Smokin’ Joe Ortiz), 2012 (Darvish & Ross), one in 2011 (Mason Tobin), none in 2010, one in 2009 (Elvis Andrus), and one in 2008 (Kaz Fukumori). Earlier today on the Texas Rangers Facebook group I’m on, a discussion popped up on our catching situation. I postulated that since Pudge left as a regular player after the 2002 season, we haven’t had that ONE GUY we could count on to be the #1 catcher, the one guy you KNEW would be there year after year. There just hasn’t been that guy. I decided to dig into the numbers (and I dug deep), looking for all of the guys who have caught for the Rangers from 2002 onwards because I wanted to prove my point. One of my long standing features of this site, the “Seat Selector” has been updated for the 2016 season. The last time I updated it was in April of 2012, and a few things have happened since then. The newest thing of course is the new scoreboard in left field, but I also have a much better camera on my phone now (iPhone 6s+), so I wanted to retake them with a better camera than last time. The first version of it went online back in 1999 (less than a year after I started the site in Dec 1998). I stopped doing daily game updates a couple of seasons ago, but some parts of the site (like this one) will always be updated. Anyway, check it out by clicking on the picture below (which I took on Apr 2, 2016 standing in Section 326. One note – the selector doesn’t seem to work on phones and tablets. Not quite sure why (except I’m using an older HTML feature called the imagemap). This does work fine using a proper web browser on a computer. I have a Twitter account for this website, but it’s pretty disused since I stopped doing daily game updates a couple of seasons ago. Still, I use Twitter A LOT. Both personally and professionally. Tonight I started a list of “Texas Rangers News” accounts. It’s basically anyone who is Texas Rangers specific (or really close to it), all together in one feed. The people I have on there as I said are folks who run pretty much all Rangers news. I’m not putting everyone who covers Rangrers news there. Two examples are TV people like Newy Scruggs and Anthony Andro. My logic for Scruggs is that he’s obligated to cover tons of things, and while he does occasionally post about the Rangers, he’s more a “generic Sports news” account. Same goes for Anthony Andro. He used to be only Rangers, but after he switched gears to FSSW a couple of years ago, he posts about everything. I think I’ve covered all the big ones (and a couple you might not have thought of). If you can think of someone I don’t have on here, and who you think SHOULD be, please, by all means. Let me know who you think I should add. NOTE: I have a Dallas Morning News feed on here because they have a Twitter specific Rangers feed. The Ft Worth Star Telegram doesn’t have one, but I followed their Rangers beat writers, too. It has been awhile since I’ve written about anything here, and those who are on Facebook know I’ve spent the majority of my time there in the Rangers Fan Group. I still keep up with the uniform number history part of my website, but most of the other ones are archival. However, from time to time, I get the urge to write about something, and that’s today.